Welcome back to Gameological’s ongoing Games In Progress coverage of Pokémon Sun and Moon. Every week, series veteran William Hughes and relative newcomer Nick Wanserski are playing through a portion of the games and offering up their thoughts on it—along with some wider impressions of Sun and Moon and the series as a whole. This week, Nick and William played through Akala Island, the second major stop on Sun and Moon’s grand island tour. As we move off of Melemele Island’s extended tutorial, and into the game proper, that assessment becomes more obviously true. Akala Island lays out the well-worn Pokémon formula quickly: walk down a route, catch some new monsters, fight some trainers, do a trial. There are a few little detours and side paths that open up along the way—most notably, a trip to a four-way battle arena with some interesting implications for the game’s multiplayer—but any tweaks to the game’s traditional systems are just that: tweaks. The other big basic change is the removal of Hidden Machines in favor of a new system, Ride Pokémon. Progress in Sun and Moon is gated with environmental obstacles, an old series tradition. In previous games, you’d get past these inconvenient rocks or rough terrain by finding special items called HMs, which taught your monsters moves like Cut or Surf or Fly. The problem was that these moves—which were usually fine, but not world-breaking, in terms of power—would take up one of your team member’s four precious move slots, potentially dinging their effectiveness in battle. (You couldn’t replace them, either, locking that slot down permanently no matter how many new moves the Pokémon learned.) Essentially, the system was an added compromise between a player’s ability to navigate their environment, and their ability to manage their team for a fight. That’s gone in Sun and Moon. Instead, you periodically receive items that let you summon Pokémon to ride around on, smashing boulders, swimming across lakes, and flying you from point to point. (It also summons a pretty nifty new outfit for the trip.) Contrarians might call this a dumbing-down of a series-standard strategic decision, but in practice, it just removes an extra headache. Like pretty much all of Sun and Moon‘s alterations, it’s a welcome easing of pain that doesn’t detract from the core team-building mechanics. Speaking of which, Nick, my team is solidifying nicely. I still have a few spots I’m not crazy about—Petilil just isn’t keeping up with everyone else stats-wise, especially since I can’t find a Sun Stone to make her evolve—but my basic elemental balance is good. (Picking up a Magby during my trip to Wela Volcano Park helped a lot.) I’ve also got a few monsters who’ve hit their final evolutions; my former Popplio, Seal, has made its way all the way through the ridiculous, pig-tailed ugly ducking phase and emerged as the visually busy but basically passable Primarina. Meanwhile, my old Pikipek, Larry, has grown into Toucannon, one of my favorites of the new Pokémon designs. (It’s not the giant, seed-firing beak but his tired, angrily dignified eyes.) Even after all these years, it’s still a thrill to see a Pokémon evolve, not only because of the improved stats or the more diverse move types, but because Game Freak has become amazingly good at conveying a new tier of power simply through the monsters’ visual designs. How’s your team doing, Nick? Are you getting the most out of evolution? And what do you think about Akala Island and its new set of trials? I too shall raise a glass of Moo Moo milk to the ability effectiveness display in battles. As a neophyte, there’s no way I could keep track of which move works best. I’m not certain if I even know all the types yet. Pokémon move sets in general make me anxious. The near-constant churn of incoming powers to replace the old gets me all wound up with indecision. A power may sound good, but then you try it out a few times and it’s dumb and you lost out on a perfectly good ability for it. I understand the strategy behind having a limited slot system like that, but it would be nice if you could keep moves in reserve, with only four active at a given time. As an aside, can I say that the Infestation power has to be the most disturbing move I’ve ever seen in a video game? It’s a continuous-damage ability, like poison, but you’re surrounded by a swarm of crawling bugs that creep up your body and damage you every round. Blergh. The main reason I’ve ever paid attention to Pokémon, besides it being an inescapable cultural juggernaut, is I’ve always loved the evolutions. I think it’s a great concept. It’s both a good carrot to keep the player engaged and demonstrates what a clever, inventive game the series is. So I’m kind of frustrated that I haven’t had as many evolutions as I’d like. Are there any secrets to leveling up that I don’t know about? Are there tricks or necessary items or prerequisites? Because I’ve seen very few evolutions. So far, straight leveling up by going out into the grass and devastating all the local fauna as a one-woman (and six Pokémon) ecological disaster hasn’t yielded the results I was hoping for. This has prompted my other game anxiety: not getting the most out of my Pokémon team. It’s been mostly unchanged from the first island, because I’m eager to see them become powerful and cooler looking. I encounter and catch all these rad looking monsters, but let them idle in limbo because I don’t want to weaken my team and halt progress on my beginning crew. I am grateful for the Experience Share feature that allows every Pokémon in my party to gain experience points from a fight, leveling up while idling inside their Pokéballs, which I assume look like the interior of the I Dream Of Genie bottle. And since you can get away winning most fights with one or two high-level critters while the rest just sort of chill, I should probably be more flexible with my team roster. As for the game structure, I enjoy performing the trials. With the requisite caveat that I haven’t played the others; going to gyms to fight trainers never sounded fun to me. It sounded like high school. I like the thematic aesthetics of the trial system—it’s a mythological journey through Alola’s natural landscapes to test yourself against these sacred totem animals. It feels more exalting than just standing on a sweaty floor mat under the halogen lights, fighting Pokémon against some no-neck. I’m sorry your video game journalism cred isn’t earning you the respect of today’s youth. If it’s any consolation, my daughter tells me regularly that she doesn’t care for Pokémon. Her heart belongs to Yo-Kai Watch. Aw, you’re being too hard on the old gym battles, Nick. They might not be quite as diverse as Sun and Moon’s trials—I never found myself playing absurd games of “spot the difference” with Marowak dancers in Pokémon X, or collecting ingredients to cook a Captain a meal in Pokémon Blue—but they still took place in some pretty interesting environments. You hit on something interesting, though, when you mentioned how limiting it feels to cap a Pokémon’s moves at four. That nerve-wracking decision (Do I lose Water Gun to gain a stat booster? Will I ever actually use this co-op-only move?) has always been a part of the series, and it’s one of those strategic concerns that sits at the intersection between Pokémon’s two halves: the bright, cheerful children’s game on the surface, and the viciously competitive multiplayer battling that lurks underneath. So far, we’ve been hanging out up top, battling punky Pokémon thieves, getting into fights with masked luchadores, and stuffing monsters into little magical balls. The competitive side of Pokémon doesn’t really kick in until you reach level 50, when level differences stop mattering and the game becomes about blindsiding your opponent with a flashy combo or a creative use of a monster they never saw coming. I suspect we’ll start digging into that version of the game more in the coming weeks. In the meantime, I’ve dipped into the game’s more mundane multiplayer features a bit, and came off a little unimpressed. Festival Plaza really is as lackluster as it seemed on first glance: some crappy shops, a few chances to get items, and an absolutely terrible “Mission” system that had me running around in circles, trying to identify which of the words in a list were written in Japanese. It’s the worst kind of window-dressing and distracts from the main event of trading and battling monsters. That part, at least, is working fairly well. I’ve had a few fun preliminary battles with people in both the four-way Battle Royale and one-on-one duel formats, and it was generally tense and fun. I especially liked Battle Royale, where the question of “Who do I hit first?” becomes an extra strategic game on top of everything else. Trading, meanwhile, feels perfectly fine, even if I’m already getting reports of illicit Level 100 monsters flooding Wonder Trade, courtesy of cheaters hacking the game. As to your experience point problems, Nick, I’m not sure what to tell you. My usual regimen is to clear every trainer on a route—something the game encourages, since you get bonus fights and items for doing so—and then try to spend enough time in the tall grass to catch anything that’s new. (Or enough time to get a headache-inducing rage on at Self-Destructing Geodudes, as the case may be.) I’m not awash in evolutions, but they come often enough that I still get that dopamine thrill when the blue evolution screen pops up. (It helps that I tend to fill my team with monsters with multiple stages, as visible on the Pokédex.) 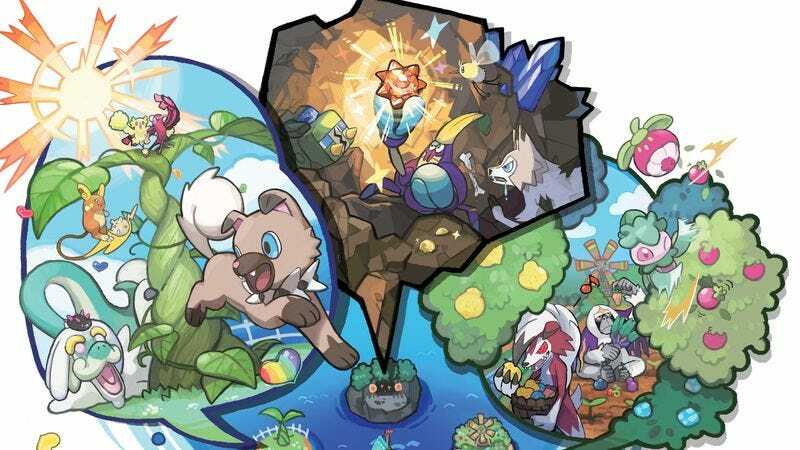 That being said, I would suggest that you try being a little less cautious about letting new monsters into your life: the game’s staggered so as to make it pretty easy to mix and match somebody new in, and part of the joy of these games is seeing how weirdos like Stufful, the adorably dorky stuffed-bear Pokémon, or Pyukumuku, the Sea Cucumber Pokémon, might fit into your team. (Also, I’ll one-up your Infestation with Pyukumuku’s passive Ability, “Innards Out,” as the grossest thing in the game so far.) You’re not going to wreck your team by letting a few fun newcomers onto it. I think that’s all I have to say this week, Nick, beyond noting that I just unlocked another mini-game. I don’t know how you feel about Poké Pelago—a magical place where you grow Poké beans and then spend them to unlock new items and boosts for your inventory and team—but I found it to be a thousand times more engaging and charming than Festival Plaza could ever be. I completely agree, William. Poké Pelago is by far the better of the two mini-games. I’m always down with development side-quests, like the series of islands you unlock here, especially when they’re passive diversions that grow more-or-less independently as you play the main quest. You can just check in from time to time, tweak a few things, and get back to battling, confident in the knowledge that your unattended Pokémon are having a swell time. Thematically, it’s more in line with the chill Alolan vibe than the frantic, hyperactive Festival Plaza. I poked back into the Plaza to see if the experience had improved and was again happy to get out. I’ll take your advice to heart and be bolder about mixing up my party. I think if I weren’t playing Pokémon Sun for review, I’d probably still be about halfway through the first island, idly grabbing every monster I encountered. I’d probably even have that elusive Abra in my party, instead of giving up after 20 fruitless minutes. Instead I’m playing with a focus on unwavering forward momentum. I’m in total dad on a road-trip mode—no stopping for snacks, I packed baby carrots. If you have to pee, pee in this bottle. But I ought to slow down, as this really is a gorgeous game. I may not particularly want to spend a forest trial gathering soup ingredients while fighting off angry mushrooms, but dang if the Lush Jungle isn’t a beautiful place in which to do it. I’ve finally sent you my friend code William, so for next time, let’s make certain to meet on video game-dom’s friendliest field of battle.